Four observations on withholding donations in response to the McCarrick scandal, the Pennsylvania grand jury report, and so on. I worked directly for arch/dioceses for some 15 years and indirectly (teaching in a seminary) for a dozen more. Readers can use that fact to discount what I say below as biased or to credit it as informed. Readers’ call. Various voices are calling for the faithful to withhold donations from the Church in response to the McCarrick scandal, the Pennsylvania grand jury report, and so on. Other voices are urging Catholics to resist such calls. As the calls pro and con seem, so far, to fall within the bounds of Canon 212 § 3, I say, have at it folks. May the better arguments win. But we should note a few relevant canonical and practical points. The Christian faithful are obliged to assist with the needs of the Church so that the Church has what is necessary for divine worship, for the works of the apostolate and of charity, and for the decent support of ministers. 1983 CIC 222 § 1. The Church has an innate right to require from the Christian faithful those things which are necessary for the purposes proper to it. 1983 CIC 1260. The Christian faithful are free to give temporal goods for the benefit of the Church. 1983 CIC 1261 § 1. The faithful are to give support to the Church by responding to appeals and according to the norms issued by the conference of bishops. 1983 CIC 1262. The roots of some of these canons, moreover, go back many centuries in Church history suggesting that more than ecclesiastical convenience is behind them. Second, in nearly all arch/dioceses I am familiar with, Sunday plate collection (and other routine donations) go to the benefit of parishes (largely by implication of Canon 1256). Thus, in most cases, withholding one’s regular donations directly hurts parish operations and not arch/diocesan. Third, many arch/diocesan annual fund-raising campaigns are, technically speaking, designed to help parishes meet assessments (canonically, taxes) imposed by bishops (in my view, usually reasonably) on parishes per Canon 1263. Withholding one’s donations to annual arch/diocesan appeals therefore, again, hurtsparishes first, though parish problems in meeting their annual assessments would be noticed at the arch/diocesan level. Fourth, arch/dioceses facing financial shortfalls generally do what any large organization does in such situations, cut expenses, liquidate investments, and/or borrow money. Thus, the actual impact of withholding one’s donations to the arch/diocese, an impact often already diluted by the time it reaches the arch/diocesan level, is likely to be muted again by the usual financial expedients undertaken by other financially stressed organizations. By the way, intimations that arch/diocesan budgets get balanced at the expense of the poor, while such suggestions smack of emotional hostage-taking, do reflect the reality that many demands are made on arch/diocesan assets (see, e.g., Canon 1254 § 1) and that no undertaking would be immune from cuts. What all this boils down to, I suggest, is that by the time one determines the exact financial footing of any given arch/diocese and predicts, rightly or wrongly, how that arch/diocese might respond to a drop in income, one should be able to see that across-the-board calls for Catholics to withhold donations “from the Church” are subject to so many qualifications and exceptions and ramifications (intended or not) that, well, it seems difficult to defend such calls as being based on convincing reasons. Still, as stated above, no canon requires Catholics to make a donation on any Sunday to any parish and, given how little voice Catholics have in the selection of their leadership and their conduct, I understand why calls to strike back in some, in any, measurable way against massive, massive episcopal failures resonate with so many. I’m just saying, be careful about punishing the Spouse of Christ and her dependent children because some priests and even bishops, men presumably wedded to her as Jesus was wedded to her, abandoned her so shamelessly. A myopically narrow canonical article that misses the forest for the trees. 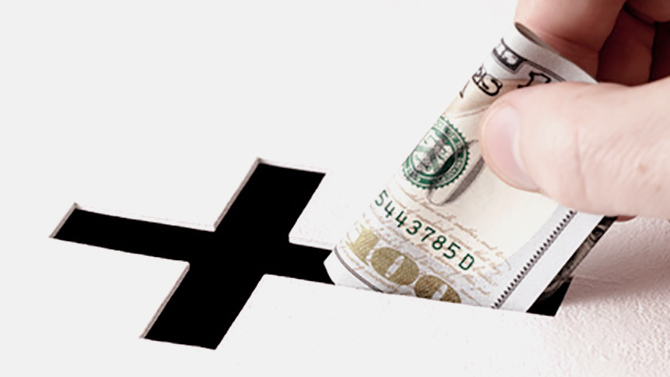 A Catholic’s obligation to contribute to the support of the Church does not somehow flow from the mandates of the 1983 Code of Canon Law or “Church history” or “ecclesiastical convenience” and has nothing necessarily at all to do with the marketing and mechanics of diocesan fund-raising and canonical tax assessments or diocesan and parish assets, annual budgets, and debt-financing. It rather essentially derives from the dogmatic, moral, and theological character of the Church and the divine mission given to it by its Founder to save souls by worshipping God in spirit and in truth, both directly in Himself as Trinity and indirectly in serving those made in His image with the same self-emptying perfection that He does. In the present-day circumstances of pervasive ecclesiastical corruption, perversion, and hypocrisy evident throughout the priesthood and episcopacy, it is a legitimate question every Catholic should be asking himself whether “support of the Church” is really served by propping up a rotten diocesan and parish structure and its deviant clerical minions or in fact giving directly to worthy and needy persons and those helping them, materially or spiritually, whether as priests or laics. I would submit that today authentic “support of the Church” is much more likely achieved by taking the $X that would ordinarily go into the Sunday collection basket and giving it to the beggar on the street with the sign “Hungry, Please help. God bless.” than in financing Father Bruce’s homosexual trysts or the Bishop or Cardinal’s all-expenses-paid life of power, prestige, and self-indulgence. Thank you for concisely stating exactly what I hoped to say. Thank you. I share your sentiments (and then some). From the financial scandals, to Legion of Christ to the 30 year recurring queer problem – I’m exhausted, I’m done – Adios ! I did my job over and over you can keep your lavender handshake on the way out. Paul…you stated that quite clearly. Until this house is purged and sanctified, parishioners will fall away. Worse…who would be attracted to such an organization? Why should anyone donate when it surely perpetuates the acts of Pharisees. Somehow the priests and bishops and arch bishops are all calling for MORE prayer, and forgiveness rather than simply saying…we will have this mess cleared out by Christmas. There is nothing being said about fixing the problem! They are killing the church…but they are not killing my faith. There is no other method to have your voice heard. Letter writing and conversation go right by them. You are rendered the disingenuous degrading deference and pandering of the clerical persona and when you turn your back their eyes flip skyward. I haven’t provided a dime to my Archdiocesan Appeal since the Bergoglian appointee pulled in three years ago. What I retain from them goes to Catholic enterprises that are faithful to the perennial Magisterium of the Church. He recently hosted the coven of the Association of United States Catholic Priests (AUSCP) and is regarded as their patron and protector. Next year it could be Jimmy Martin and the rainbow coalition. Any bureaucracy serves itself first. The leftovers go to the intended needy, etc. So what suggestions does Dr. Peters offer for the laity? What can lay faithful do to facilitate the canonical deposition of a bad bishop? Protests are unseemly if done in the eye of the non-faithful. That which was to go to the diocese i will give to Catholic Social Services in my county. I wish not to have a nickel head to Rome. Where does the sheeple, cult-lime mindset end? Be careful? A little late for that advice. Earmark your donations. Make sure nothing goes to national bureaucracies.Or Vatican dopiness. The Pope himself insists poverty is overture anyway. Donate to Ignatius Press, for crying out loud. But the AmChurch is not the Bride of Christ. Maybe the abused child. Aug. 16, 2018: Cardinal Wuerl just hired a high class public relations group to help get positive images of Wuerl out to the public. Such a group must cost a lot of money – where is that money coming from? Some of the predators spent a lot of money on their deviant pleasures and luxuries – where did that money come from? Some deviant priests spent a fortune on their male lovers – where did that money come from? Stop giving money that goes to Cardinals and Bishops – period. Ask your Parish Priest what your Parish needs – and give directly to that – a food bank, a roof repair, shelters for the poor etc.. it seems that Pope Francis said he feels shame and sorrow and is on the side of the victims – I just don’t understand such a comment. Whose side would he be on if not the victims? Shame and sorrow are fine but what is he going to do to cleanse and restore the Church and atone for abominations committed by the Clergy; when is he going to address the incredibly powerful homosexual network in the Vatican which spreads its tentacles everywhere? He should send away his inner circle confidantes and start anew. The cleansing needs to begin with the Pope, the Chief Shepherd of the flock and he needs to come up with a plan of action for every state in the USA and then go and do the same thing in other countries, including Italy where Priests are openly living with their partners – male and female. And perhaps it would be good if the Pope declared a new crusade against all this filth – a crusade of prayer and penance, starting at the Vatican and encompassing all the Cardinals and Bishops globally. We should remember that reform in the Church starts with us – the laity. It is up to US to start the healing – on our knees. The fact that this mess is not our doing is irrelevant. I donate at Mass every week, I give to a soup kitchen in Alabama every month, I give away food clothing and cash during the year. To the Bishop – nothing. If he speaks out about this mess, perhaps I will change my mind. If he would speak out about Senator Collins who claims to be Catholic but who is pro-choice, perhaps I will change my mind. What he and his fellows must realize and ACKNOWLEDGE is the fact that they have betrayed our trust and have been doing so for a long time, and regaining our trust is going to be very difficult. I am not accusing Bishop Neely of any specific misdeed, but he must realize that the days when his mere title would automatically engender respect – and help to open wallets – are gone. Are you sure he is not one of them? Why should anyone trust current canon law? It was foisted on the world by rapists and conmen. Not a dime should go to Rome or any Roman Diocese. If Rome doesn’t like that, well, they can just change the laws to shame people, like they changed the Catechism, but it won’t matter, because the vast majority of people don’t care anymore. In this round of the abuse crisis, the conservative/orthodox are fueling hysteria towards a political end and agenda. We left the heart of the crisis in the early 80s without even knowing it just as we lived through it in the 70s unknowingly. Stop the ridiculous rhetoric about losing one’s faith and nothing for the pope. You sound like Call To Action! There are the occasions when some new prelate is installed as boss of wherever and it is shown on EWTN and it is inevitably lavish to the extreme, and I find it it unpleasant, for lack of a better word. It is a lavish display of great wealth that is off-putting, especially given the times through which we are passing, in the Church and in the world. The bishops love invoking canon law, all the while telling illegal immigrants to ignore US civil law. Covert rescues of widows yes. Newark Archdiocese with a retired Bishop doubling the size of a donated mansion on 18 acres with three water sports for him alone and non exempt property taxes of probably $30K…and the active Bishop having an lgbt Mass to include known couples leaving Communion up to their conscience…….well…count me out….no matter what the canons say. said by my dying aunt millie. I am not sure what your intention was in writing this piece, but all you have accomplished is to destroy your credibility. If I see your name on future articles, I will keep in mind that in this time of great crisis in the church, your concern was to be sure that money continued to flow in so that others like Wuerl, McCarrick and Cupich can continue as they are doing. Since 1999, the laity have been desperate for the hierarchy to deal with this, with no results. It is a time for the most drastic measures possible. With prospects of our Church losing financial support as a response to the homosexual abuse scandal, the cover-up and Dr Peters’s understood concern, it’s a blessing (maybe) that the federal government largess regarding RCC generosity is likely to continue. Along the lines of individual participation simple awareness is important. Diocesan calls for unleashing something or other where nothing is really leashed, merely (perhaps intentionally) obfuscates that awareness. We should begin with a token church-wide penance as a start at making folks a little more aware. A halt to all beer and wine sales on church grounds at all festivals would do. A good place to start is at the Our Lady of Scapular festival in Wyandotte Mich August 24-26. If you have to preface an article about this topic with a blurb that your livelihood was significantly afforded by continued giving, so you’ll let the reader determine if that’s bias or “being informed,” then… it’s most likely bias. If you have the gall to tell people, “As the calls pro and con seem, so far, to fall within the bounds of Canon 212 § 3, I say, have at it folks.” Then proceed to write a litany of reasons that seem more guilt-trip than canonical interpretation, then you’ve pretty much confirmed your bias. And in doing so, confirmed that it’s time to shut the wallets. Please remember the Lord’s Prayer brothers and sisters. My household will continue to regularly contribute to our parish and diocese collections, and for much the same reasons that Dr. Peters described in the article. Give to Catholic Charities. In my diocese movies give to the parish do not go to the cathedraticum which is a separate fund and appeal.